This week’s What’s Cooking Wednesday recipe comes straight from my Italian-American grandmother, who introduced me to alcohol by offering me a peach slice that had been soaking in red wine for goodness knows how long. I don’t know how old I was, but I do remember having to look *up* at the kitchen table to accept said peach slice. To be fair, I was always smallish. Peaches in red wine are a great simple summer dessert after you’ve enjoyed a fabulous meal and want the party to last just a little bit longer. They are also great as an afternoon pick-me-up, and depending on the strength of the wine, this could pick you up *and* spit you out. But you’ll enjoy every moment! So the ingredients this week are few–no, not even, they’re couple. 1. You need some red wine; if your father-in-law makes it like mine does, all the better. Kindly note of our fancy wine glasses. Yes, they are Nutella glasses. You see, we’re paesani and real wine glasses rarely make it out of the cabinet. 2. 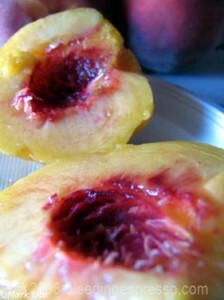 You need fresh, ripe peaches. For those of you who don’t like peaches because of the fuzz, this recipe is for you since I recommend peeling the peaches before soaking. Peel, remove the pit, slice, and place in a glass of red wine. Let soak for as long as you can stand it. I usually leave them in the wine for about 10 to 20 minutes. 3. Enjoy each delicious slice one at a time with sips of wine in between if you like. Notice, as well, our fancy plastic plates. What you see is what you get, faithful readers — there ain’t no fancying up peaches soaked in red wine in this house. But they’re still pretty, don’t you think? Do you soak your fruit in alcohol? Do tell! Most of our glasses are Nutella pots, too! Yay, Nutella! The chocolatey hazelnut spread that just keeps on giving! Certainly alcohol/fruit pairings indeed…but do you *soak* your fruit? Hmm…. I remember the wine soaked peaches. They were so good!!! We have been getting some real good white peaches and I think at least one of them is getting soaked in some red wine in the next day or two. Well he *does* have a point…. I love sangria, and I’ve poached pears in riesling and sugar syrup, but I never would have thought of this. It looks gorgeous — sounds delicious! Ooh those pears sounds lovely too…. See, I was hip and didn’t even know it! 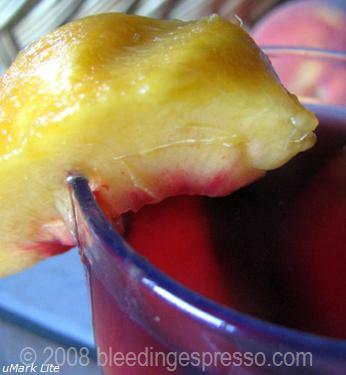 I *heart* peaches in red wine … in fact, I am heading to lunch now … hmmm…. I’ve heard of this but never tried it (but will surely do so). I never soaked fruit, but a local bar used to sell maraschino cherries in grain alcohol and then sell them for $1.00 each. You didn’t have to worry about spending too much, that’s for sure! Geez, maraschino cherries for a buck each?! They must’ve sold better very *late* in the evening 😉 I think you’ll enjoy these peaches! I could use one of those peaches now! That looks scrummy. And I have to tell you that seeing the nutella glasses brings me right at home in my childhood in the late 1970s and 1980s in Switzerland. We had nutella glasses, but also glasses that used to be mustard jars. And some of those had cartoon characters. To this day I am still confused why really tasty, even slightly grainy (not too grainy though coz it was still a cheaper brand, but it was so good) mustard would end up in jars (and then glasses) that had donald duck on them. Of course, don’t get me wrong, at age 4 i was always requesting the donald duck glass. Oh that’s too funny with the mustard! I have some World Cup Nutella glasses that I’m particularly proud of…and also Shrek! I think it is something which should be tried and it is reasonably looks very good to me as i am a love of red wine and Peaches. Most of my endeavours comes to an end due to my wife because she think that I always do silly stuff. I think this can impress her as well. Love fruit in wine. Love to poach it on the stove in winter too. I love to soak it, then serve the fruit with a little marscapone and honey. Mmmm…fruit and wine and cheese and honey…YUM!!!!! Thank you for visiting my new blog — and as for chickpeas, I hear you. I am not sure I saw canned chickpeas in Switzerland growing up, ever. Dried chickpeas was all that there was. As a result I still often cook dried chickpeas, though I appreciate the luxury of always having a couple of cans on hand at home. Always having that backup can means that I can make hummus anytime, without planning, and have dinner ready in under 8 minutes. Can you easily find dried chickpeas and lentils where you are? Marie’s last blog post..What to do with an over abundance of veggies!! How delicious! It’s peach season here in MI, and my equally red-wine loving Swedish daughter will be here soon, so I think this will most definitely have a place at my table. 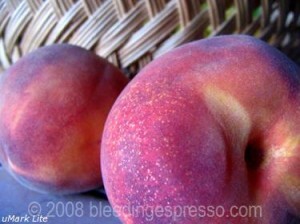 I’m making a low fat peach/blueberry cobbler today. YUM! 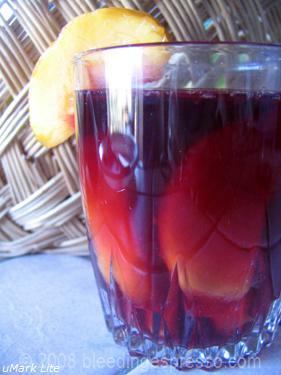 As for soaking fruit in alcohol, I adore pears poached in wine and I use raisins soaked in rum in a variety of recipes. Yay for simplicity, tasty freshness, and incorporating wine into recipes! I remember looking up to accept olives out of my grandparents’ martinis. Same same, but different? Wish my father-in-law made red wine! Boots in the Oven’s last blog post..Bacon, Bacon, Bacon! Hey, your HusBear makes bacon, unless that’s you HusBear! My mom used to make her own liqueur. My parents’ neighbor had a grape vine growing over the fence onto my parents’ property. I don’t know exactly how she did it, but she used really cute bottles and it tasted really good. Oh that sounds fun, Anali…pretty too! I am so getting peaches next time I go to Whole Foods. Are you trying to tell me Italian Nutella comes in highball glasses? I went into a shop on the North End (big Little Italy Boston) that advertised “imported Nutella” and waited in line, all excited… only to find it was imported from Canada. Whoop de sh*t.
That is hilarious! After the fact, of course. And yes on the Nutella glasses…. I soak pineapple pieces or raisins in rum, before making them into a cake. ah, the beauty of a NON-cooking recipe during the heat of the summer! Good in so many ways. I’ve been eating my peaches in sorbet form the last couple of days, I admit. Now I’ve got to try this! OK well sorbet would make me happy too…. Tonight I’m canning peaches. I am going to put a couple of tablespoons of late harvest vidal wine into each jar. When the snow flies, I’m going to be so happy I did. I’ll post the recipe in the next few days. Kath’s last blog post..Clicking along. Fruit soaking in alcohol? Yes, once, in everclear one woeful summer day in Myrtle Beach. After this, I thought I’d never again soak my fruit in alcohol. But Peaches and Red wine might to too tempting to pass up. I’d have to say that I’ve never soaked anything in wine before. But I’m definitely going to try your featured recipe! I’ll eat and sip alone since Alex doesn’t drink!!! do you prefer your reds on the smoky/robust side or more fruity? Eryn’s last blog post..My Weekend…..phlog! Didn’t you mention the soaked peaches in red wine some other time? I remember hearing about them and I’ve been wanting to try them ever since. Sounds so yummy. Simple. I like simple too. I’m sure I did; in fact, perhaps in that meme I linked to 🙂 So tasty! Oh, my word! It’s too early in the morning for me to be thinking about peaches in wine. That looks delicious. Your pictures are soooo tempting. 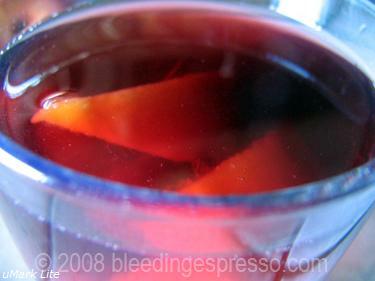 Sangria wine is about the most I’ve experienced of wine soaked fruit, and the fruit wasn’t the object of the game, lol! i’ve done it for pies and granitas… hope that counts!! This sounds so simple and delicious. We’re going to Gulf Shores for vacation next week so I’m going to try it there. OMG! Just picked up some fresh peaches and I am opening a bottle of wine. This sounds amazing! That brought tears to my eyes. We recently lost my Grandfather, and when I euologized him I spoke of all the summers he’d make peaches and wine for us. That will always be what summer tastes like to me. I diced up yellow and white peaches and soaked them in Lapponia Lakka, a Finish ‘cloud liquour’ that is lighter in taste than brandy. They soaked for about 4 hours, and were served spooned over vanilla bean ice cream. Delish!